Hayward – Ventures Unlimited Inc.
Ventures Unlimited provides a multitude of support services to adults with disabilities in Hayward, Wisconsin. Ventures’ primary facility is located on the south end of Hayward, at 10140 Highway 27 South. The 10,000 sq. ft. facility was constructed in 2003, providing ample room to house a range of vocational training programs as well as a comfortable day services program, 1:1 Mentoring/Independent Living Skills Training and a Wellness Program. 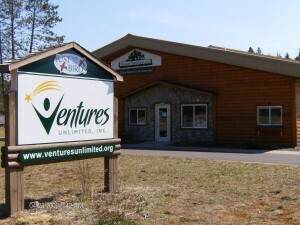 Ventures Unlimited is open from 7AM to 4PM, Monday through Thursday. Visitors are always welcome, with tours available by appointment. Phone number is 715-934-3035. Contact Tom Sweeney today.